The line outside the historic Carnegie Deli is 33 people deep on an overcast Sunday afternoon. Overhead, the 79-year-old deli’s iconic neon sign is acting its age. The "arne" in Carnegie is burned out, and the "ss" in delicatessen and "ra" in restaurant are flickering nervously. "How much longer, do you think?" asks a woman from San Francisco, standing near the back of the line. "Depends on how fast people eat," says Marty Schneit, a gregarious white-haired gentleman in black-framed glasses and a navy blue windbreaker. "The sandwiches are huuuuge." A lifelong New Yorker, retired photographer, and current city tour guide, Schneit turns 79 himself this year -- the same age as the Carnegie, which first began serving up Jewish classics like matzo ball soup, chopped liver, and, most famously, super-sized pastrami sandwiches all the way back in 1937. (“Wow, that’s pretty old,” Schneit laughs.) But to hear him tell it, the two didn't exactly grow up together. "We went to Katz's most of the time," Schneit says, referring to Manhattan’s other famous Jewish deli, which is even older. "And coming from the Bronx, we had a lot of good Jewish delis in the Bronx. Practically every block had a Jewish deli back then.” Meanwhile, the Carnegie Deli, with its mid-century celebrity-magnet mystique and prominent Times Square location, was “always a big tourist attraction,” he notes. “It was always crowded, so I hardly came here. I don't have many stories about this place." Like all New Yorkers, however, Schneit suddenly has new reason to eat at the Carnegie. 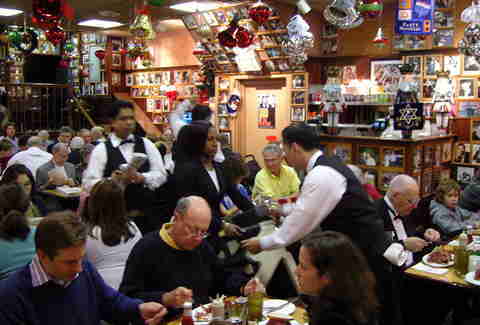 On December 31st, the famed deli is shutting its doors for good. "I have a gift card,” says Schneit. “I figured I better use it." 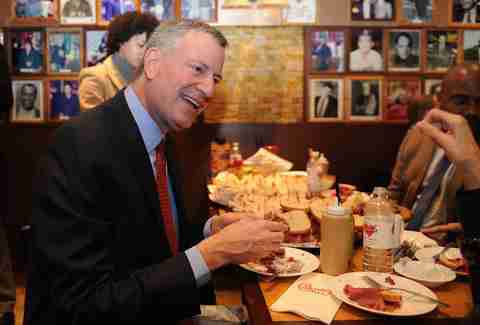 Only last February, city officials were celebrating the Carnegie Deli’s triumphant reopening after a 10-month-long hiatus. At the time, NYC Mayor Bill de Blasio tweeted a photo of the deli’s piled-high pastrami sandwich accompanied by a single word: “America.” No such patriotism when news broke of the deli’s final curtain call. The mayor’s office formally declined to comment for this article. A moment of silence was probably appropriate. When it closes at year’s end, the fabled Carnegie will join a long list of bygone Jewish delis in NYC -- a once ubiquitous part of city culture, now struggling for survival in a highly competitive, highly diverse restaurant scene. New York and its delis go way back -- more than a century, in fact -- to a massive wave of Ashkenazi Jews immigrating to the city from Eastern Europe, beginning in the 1880s. The newcomers primarily kept kosher (meaning no pork, no mixing of meat and dairy) and their cuisine, blending Yiddish traditions with various other influences from eons of migration, really caught on in the city. By 1931, city records show more than 1,500 kosher delicatessens operating in the five boroughs. The city itself played a big role in the deli’s rise. In his James Beard Award-winning book Save the Deli, author David Sax writes that the deli, as we know it (that sit-down-style lunch counter, serving heaping, hearty portions of food), is “every bit as much a product of New York as it is of Yiddish European culture.” Sax cites the uniquely American obsession with the sandwich as a major factor. To wit: Pastrami is a Romanian import, but pastrami on rye bread? That’s all New York. The connection between NYC and its delis is underscored in a number of films and TV shows featuring these types of restaurants, like the famous “I’ll have what she’s having” scene in When Harry Met Sally... and, more recently, countless episodes of TV Land’s The Jim Gaffigan Show. The Carnegie Deli itself served as a backdrop for Woody Allen’s 1984 flick Broadway Danny Rose; the restaurant later named a hefty sandwich in the director’s honor. “The Carnegie represented the idea of the Jewish delicatessen in the American imagination." While it probably seemed like the unstoppable Shake Shack of its day, a host of factors -- including shifting city demographics, changing tastes, rising food costs, and real estate pressures -- have since taken a toll on the once-dominant NYC deli. Nowadays, there are only a few dozen left in the entire city. And then there’s the Carnegie, which, alongside its now-defunct neighbor, the Stage (shuttered in 2012), represented something else. “They were the Jewish deli as show business,” says Sax. In its 1940s and 1950s heyday, the Carnegie benefitted greatly from its location on Seventh Ave near West 55th St, smack in the middle of New York’s then-bustling entertainment industry. 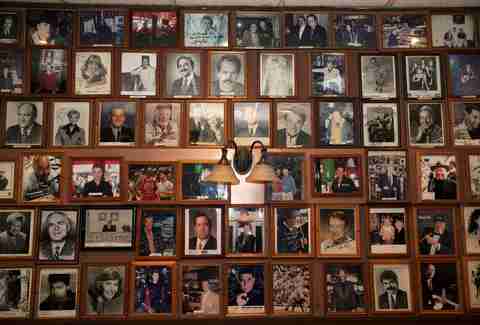 “The Broadway world and the world of television were all based around there, and you had comedians, writers, and actors coming in,” says Sax, noting the countless autographed portraits of once-famous patrons that adorn the deli’s walls. “The Carnegie represented the idea of the Jewish delicatessen in the American imagination,” he says. 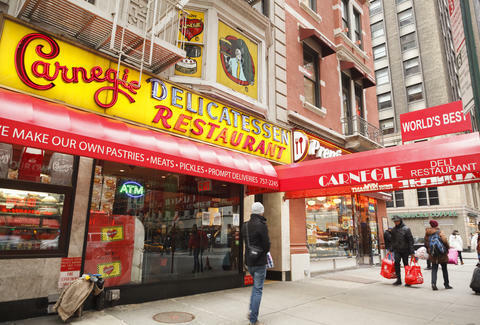 To this day, the Carnegie has remained the go-to deli for NYC tourists. But that doesn’t mean that its looming demise will only impact the hordes of out-of-towners lining up for an overstuffed sandwich fix. For the city as a whole to lose one of the last remaining pillars of this storied culinary tradition -- after sacrificing so many other locations along the way -- is a significant blow. Indeed, the past few years haven’t been easy for Levine, involving a costly $2.65 million lawsuit over back wages owed to employees and the discovery of an illegal gas hookup that forced the deli to close for 10 months. Oh, and there’s the matter of Levine’s messy divorce from her former husband and co-owner Sandy Levine, whom she accused of conspiring with a waitress turned mistress to steal recipes from the deli, which were later used to open a restaurant in Thailand. At least a few restaurateurs expressed interest in buying the business. One of them, Sam Musovic, an Albanian immigrant from Montenegro who got his start in the industry as a dishwasher at the Carnegie back in the 1970s, likens its looming closure to “taking the Empire State Building or Statue of Liberty away from New York,” he says. “We need things like this, or else New York is just another city.” Within days of the news, Musovic staged a highly publicized rally outside the Carnegie, publicly asking Levine to consider selling the business to him. His emotional pitch went nowhere. Perhaps it’s poetic that this style of eating -- which, according to Sax, some have called “the original fusion cuisine” -- would itself get lost amid a subsequent flood of foodstuffs from all over the world. “Now, there’s such an influx, I mean, you’ve got Nepalese, you’ve got so many different cuisines,” says NYC food historian Francine Segan, who suggests that New Yorkers’ evolving dietary habits have also played a role in the continuing erosion of the city’s deli culture. “We don’t eat the way we ate in the 1800s, when these delis first came to New York,” notes Segan. “In the 1800s, people were often working in freezing conditions. They needed a lot more body fat, they needed a lot more calories everyday, and so those were the foods that they brought with them, the foods of the turn of the century.” A century or so later, appetites are a lot different. “People are interested in less fat, lighter food,” she says. Even so, Segan can’t imagine the total extinction of deli in the city. “New York will not be without Jewish delis,” she says. “There will be those few that remain.” Segan points to Katz’s, in particular, which not long ago struck an air-rights deal with developers that ensures the historic deli is spared from the wrecking ball for the foreseeable future. Over the years, Katz’s has also expanded its menu, offering things like a very non-kosher cheesesteak to better cater to wider groups of people. “The cream will rise and those in the perfect neighborhood, those that have a wide menu, they’ll survive,” says Segan. Others, like restaurateur Ed Schoenfeld, whose popular pastrami egg rolls at RedFarm are an obvious deli ode, suggest the genre has actually shown some signs of rebounding, with younger, more modern incarnations like Mile End and Frankel’s opening in recent years. Still, it’s unlikely to ever regain its former prominent stature in this very different city of today. "Is it a tourist trap? Is it expensive? Are the sandwiches ridiculous and meant for tourists taking pictures? Sure. But it’s also a fascinating, wonderful, funny, and often delicious place in a part of the city that has really lost all of that." In that spirit of community, we decide to share a table when it’s finally time to sit down, about a half hour later. Beside us is a family from Brooklyn, also here to pay their final respects, and at the far-end of the communal eight-seater, a pair of tourists taking a selfie with a framed, autographed portrait of the actor David Hasselhoff from his Knight Rider days in the early 1980s. Schneit remarks that today’s celebrities are probably a lot less willing to associate themselves with a red-meat establishment like this. A quick survey of the other glossies suggests he might be right. When the food arrives, the sandwiches look even more monstrous than I remember. Somehow, over the next 40 minutes, I’m actually able to polish off the entire 4in-high monument of carnage. It’s luscious, peppery, and delicious. Schneit finishes his too. Throughout the endeavor, we are compelled to chat up neighboring diners about this place and its recent TV-drama-worthy history, which gets me thinking about what it all means. Pastrami may never die. It carries on in the form of chef-driven dumplings, egg rolls, and countless other fusion-y incarnations beyond its old-school sandwich trappings. But this particular experience, sharing tales of local lore with strangers, all united by that basic urge of hunger, is really what’s at stake. When the Carnegie Deli is replaced with say, Chipotle, or some other soulless chain, will customers engage with each other the same way? Probably not. Chris Shott is Thrillist's senior New York editor. He's not Jewish but he eats like it. Follow him on Instagram and Twitter.